"Quickly and Easily Create High Profit, High Demand, Top Selling Hypnosis CDs and MP3s"
Pull income from the Internet by selling CDs and/or downloads. If you have hypnosis knowledge, the easiest way add an incme stream is with with hypnosis recordings. 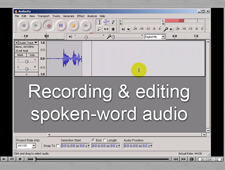 This program shows you how easily to make those recordings on your computer. you’re a hypnotherapist who doesn’t make CDs and/or MP3s to sell. you have hypnosis knowledge and you’re not using it to make and sell your own hypnosis recordings. you speak in public, do workshops or classes (or want to) and you don’t have CDs for sale. 31:33 of video tutorials showing you how to get free recording software, how to record your voice, edit out mistakes, add music (if you want to) and create a final track. 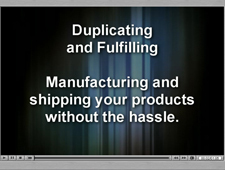 Your guide to getting your CDs manufactured and shipped for you. It’s 16:17 of video tutorials showing you, step-by-step how to create your CD in the correct format. You can even use pre-existing artwork to make the process as easy and quick as possible. Information on what kind of microphones to use, how to enhance your recording environment, how to get the best deals on equipment and tips on making your voice sound great. 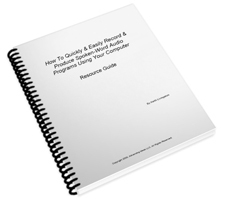 It’s 16 pages of rock-solid, practical information, in PDF form. One of the biggest challenges in making hypnosis recordings is finding music for them. You can’t just download your favorite instrumental music and use it–it’s against the law. And getting your nephew to record his band is a can of worms you don’t want to open. And did you know that most royalty free music is for commercials and comes in 15, 30 and 60 second lengths? No way you’re going to use that for a hypnosis CD. Plus, royalty free music is expensive! There’s a hypnosis music CD out there that sells for $59.95–just for the music. And honestly, that’s a bargain. 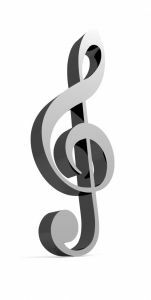 If you had to hire songwriters, musicians and studio time to record music for your hypnosis recording, it would cost thousands! But don’t worry. This package includes 57:40 of royalty free music for you to use. The longest cut is 23:30 (it’s made up of some of the other tracks spliced together). You can easily splice this track together twice to make a 45 minute background music recording. 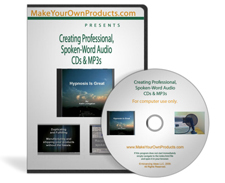 …and the video tutorials will show you how to add your voice, mix it all together and create a finished hypnosis recording, ready to sell on line or in person. And I’ve turned many a “free” speaking engagement in to a paying gig by having CDs to sell. One thing you’ll notice about the successful people in the field is–they all have products! And audio products are among the easiest to make, if you know how. This program will teach you how. This program won’t show you how to write inductions or suggestions. There are no scripts inside. You’ll need a computer and a good microphone. The program will help you pick the right microphone. Just about any computer built in the last five years will do for recording and editing audio. Basic computer skills are required. If you don’t know how to save a file or start your computer, it probably is not the program for you. This program will run on a Mac but the sections on how to burn a CD and manufacturing disks mention software for PCs. Mac users can use iTunes to burn audio CDs and there are workarounds for the manufacturing process. Just know that you Mac users will have to do a bit extra. I used to teach audio engineering at the college level before I got in to hypnosis. I know how it works and how to explain it to regular folks. 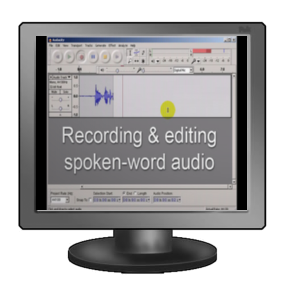 So, watch — and let the video tutorials I made will take you by the hand and lead you through how to make your own spoken-word recordings.